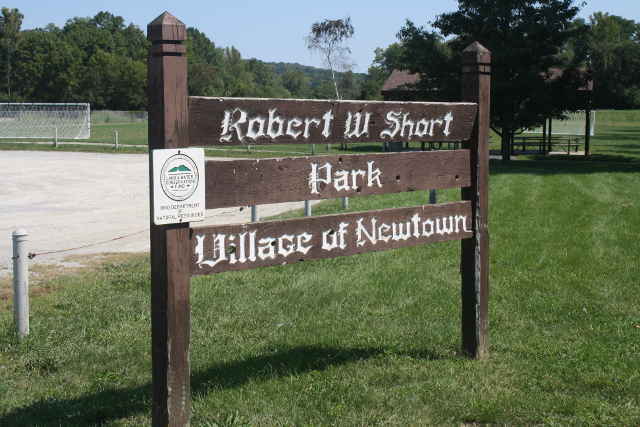 Robert W. Short Park is conveniently located at 3623 Church St., Newtown, Ohio, which makes it a great central location for getting in a quick walk while making other stops. Even though the Newtown area is highly populated, the park is out of the way enough to be away from the crowds. 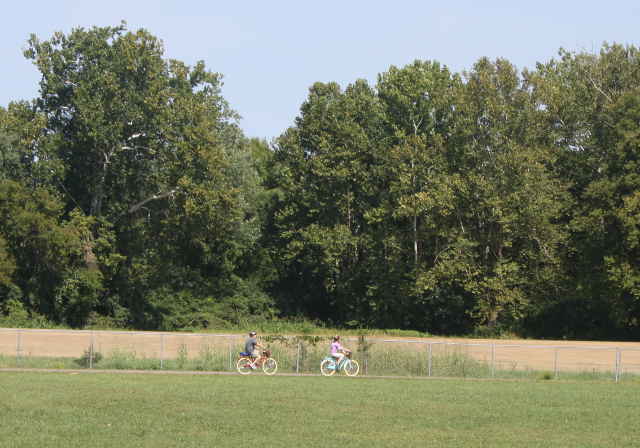 There is a lot to do at the park, including two paved parking lots, one right on Short Park Road, off Church Street, with a basketball court, and one at the far corner of the park off Debolt Street at a stretch of the Cincinnati Bike Trail. 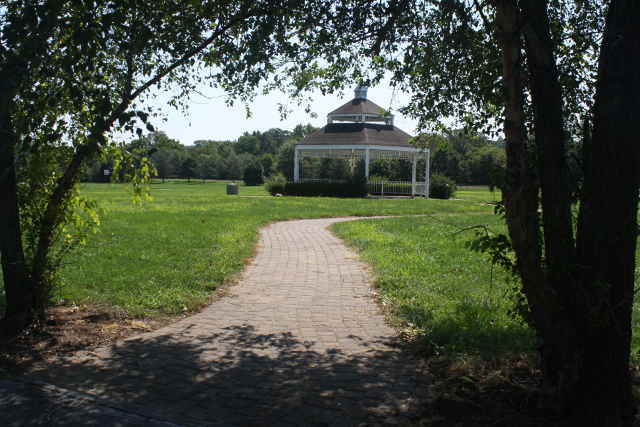 Besides the basketball court, there is a soccer field, two shelters with grills, a playground, gazebo, and paved walking trail with benches and exercise equipment along the trail. We arrived at the parking lot on Short Park Road at 12:20 p.m. on Sunday, Sept. 3, 2016, it was sunny, 87 degrees, with a mild breeze. There was a case for an information sign at the parking lot, but it was empty with grown-over weeds around it, the basketball court was missing some baskets, and the asphalt trail was in need of repair. 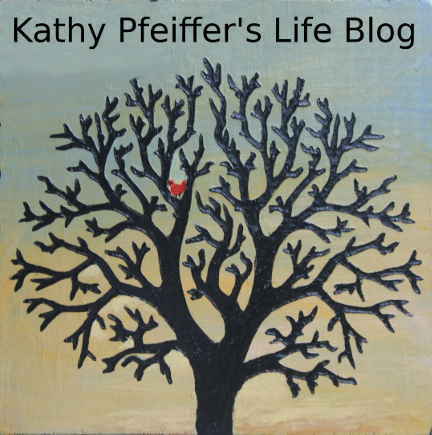 We walked the marked 1/2 mile inner loop around a small field first, sharing the trail with one other person with dogs, and enjoyed ourselves despite noticing things that needed attention. The plastic benches were grey with mold, two trash cans were knocked over, the trail surface was breaking apart in some areas, and the swing-set was missing a swing. The gazebo in the center of the field, however, looked like it was in good condition. Next we walked the outer trail, part of which is a stretch of the bike trail running beside farm land. A few people with bikes parked off Debolt Street, which was an easy way to enter the bike trail. We walked a total of 1.50 miles before leaving to drive to the Newtown Farm Market, just a mile and a half away at 3950 Round Bottom Road. The stop at the market was a great way to round off the day. 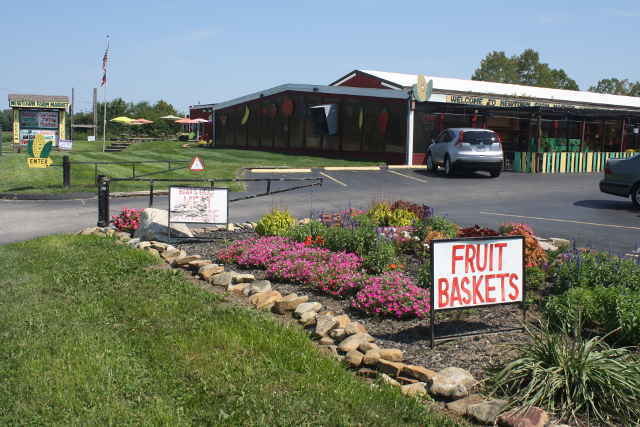 It is situated on farm land with an outdoor eating area, making it the perfect way to stop for a bite while continuing to experience the joys of nature. Restrooms: There was a small brick building with restrooms in the center of the park. They were open, cool inside, but trash was on the floor. Traffic Noise: There was very little traffic noise. Interesting Features: It was a great compact park with a lot to do in a small area. 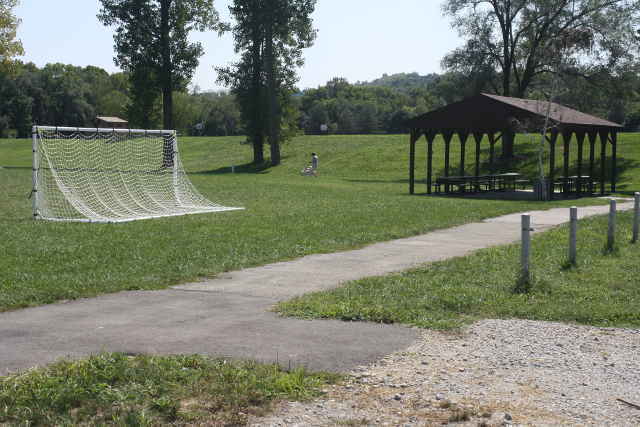 Even though people were using the soccer field, shelter, and bike trail, it was not crowded by any means. The bike trail entrance on Debolt Street was a great alternative for those wanting to use the bike trail and avoid other crowded trailheads. Little Miami Bike Trail runs alongside Short Park.. 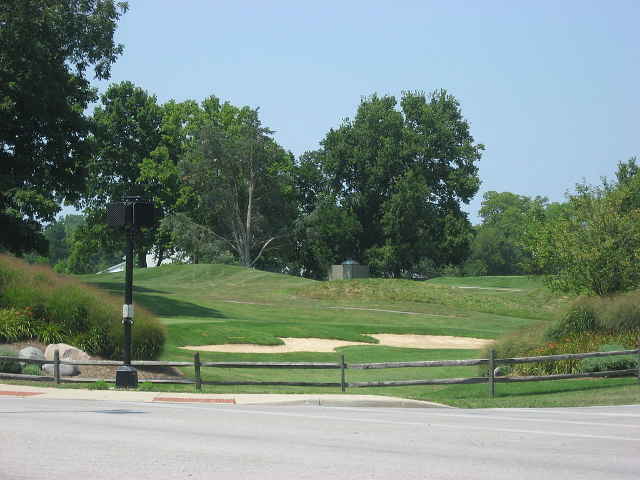 Historic Points of Interest: Just 600 feet from the park where the Little Miami Bike Trail reaches Church St., lies the Perin Village Site, once a prehistoric Hopewell Indian Village, that is now part of the Little Miami Golf Course. It has yielded many Indian bones, and archaeologists believe may house many more artifacts. Another Indian mound also exists one street over at the Odd Fellows Cemetery. Overall Rating: Even though the park was in need of some cleanup and repair, it was a pleasure to be there and enjoy the wide open space of the farmland and the trees and butterflies along the peaceful trail. The farmer’s market was the perfect place to stop on the way home, rounding off an excursion that lifted our spirits and fed us, body and soul.